(MISSISSAUGA, ONT. )—Subaru Canada, Inc. (SCI) is pleased to announce that the 2018 BRZ will be available in showrooms across Canada this winter. The rear-wheel-drive sports car for car aficionados, BRZ enters the New Year with a new lineup that includes both a new trim, the Sport-tech RS, and the much-anticipated limited production BRZ tS. The naturally aspirated 2.0-litre 4-cylinder SUBARU BOXER engine with direct and port fuel injection provides up to 205 horsepower that is controlled effortlessly by either the 6-speed close-ratio manual transmission or the optional 6-speed automatic transmission with gated shifter with manual mode and paddle shifters. For 2018, the BRZ introduces a choice of four trim levels into its lineup. The BRZ entry model comes equipped with six-speed manual transmission; new 7-inch infotainment system that includes GPS navigation as well as Apple CarPlay, Android Auto, STARLINK smartphone integration, Bluetooth mobile phone connectivity with voice activation and Bluetooth streaming audio and SiriusXM Satellite Radio; wiper-activated headlights; welcome lighting and one-touch turn signals. 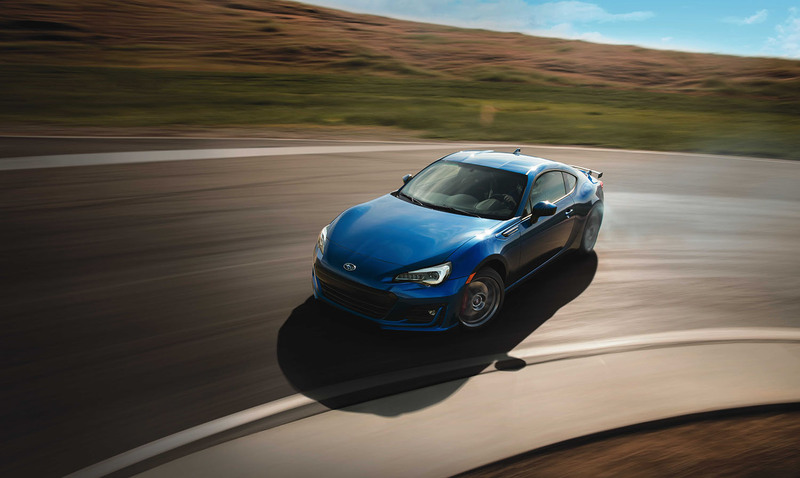 The 2018 BRZ Sport-tech is equipped with six-speed automatic transmission, heated front seats, black leather with black Alcantara and red stitching, dual-zone climate control, LED fog lights and proximity key with push-button start. A new trim for 2018, the BRZ Sport-tech RS with six-speed manual transmission becomes an excellent choice for those wanting performance SACHS dampers, performance Brembo brakes and 17-inch gunmetal grey alloy wheels. The other exciting addition to the 2018 BRZ lineup is the limited edition 2018 BRZ tS, representing new levels of performance and driving thrills. With only 100 units available Canada-wide, the tS – short for “tuned by STI” – comes with impressive levels of steering responsiveness, power and control, as well as sharp good looks, due in part to an exclusive STI carbon fibre rear spoiler that is manually adjustable to fine-tune rear downforce. About Subaru Canada, Inc. Subaru Canada, Inc. is a wholly owned subsidiary of Subaru Corporation of Japan. Headquartered in Mississauga, Ontario, the company markets and distributes Subaru vehicles, parts and accessories through a network of 93 authorized dealers across Canada. For more information, please visit www.subaru.ca or www.pr.subaru.ca or follow @Subaru_Canada on Twitter.